This eBook is meant to be a starting point for the ever increasing number of people wanting to get into amateur radio digital modes of communication. I hope this makes getting started in Digital a glad and easy experience. Even if interfacing using other manufacturers interface devices other than from Donner's Digital, most setup procedures are similar, so this material should still be useful. 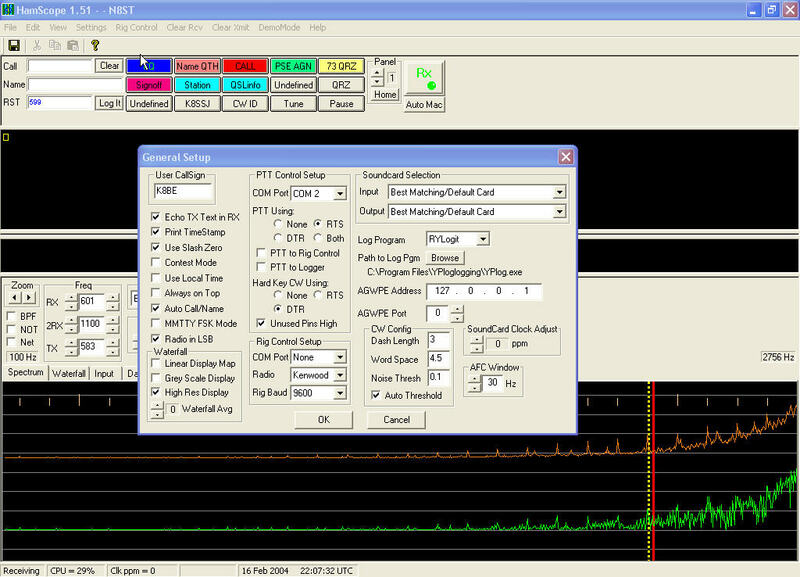 For modes other than SSTV, it is recommended to use a PC that runs at a minimal speed of 100 Mhz. Some success has been attained as slow as 75 Mhz, but that gives little or no margin of resource. Memory recommendation is 32 megs or more. Your best bet is a 300 Mhz (or faster) machine, with 64 megs (or more) of ram. The PC needs at very least, a 16 bit Sound card, ie: SoundBlaster Pro. Please note that some softwares for digital communications use a direct access to the sound card hardware, and in some instances, Soundblaster "compatible" cards may not work. It is always best to use a Creative Labs Soundblaster card (Pro, 16, 32 AWE, 64 AWE) when possible. A "compatible" card will work usually; but it depends on the software being used. Some programs will work with most cards, but keep in mind that if you have problems, you may need a genuine Creative Labs card. Always install the latest driver available, since older drivers might contain bugs. Some programs which run under 32 bit operating systems may require a 32 bit sound card driver. Some drivers for Windows 95/98 may actually be a 16 bit driver instead of the 32 bit driver that you need. Having tried several types/brands of sound cards here, we have had best results using an inexpensive Crystal Fusion card, which is also stable enough for SSTV. Video is not too demanding unless one wants to operate SSTV, and then all resources need to be faster and stronger. The PC should have at least 1 free serial port, preferably a DB-9 style connector. We have learned from personal experience, as well as from several of our thousands of customers, that not all computers lend themselves for digital communications requirements. An example of this is a Dell Inspiron Laptop. A good machine, but the worst choice for digital use. This machine is notorious for the serial port coming up high on startup, and along with that, a serial voltage much lower than standard. There is a software fix to cure the high start, but none for the low port voltage. There have been reports of a few Compaq laptops also having low serial port voltage, but from experience I have only incurred the trouble with the Dell. When we go mobile/portable, we use an IBM Thinkpad, or a HP laptop. Nearly all desktop computers seem to do the job very well. Having tried nearly every available software, we found ease of setup and operation in available freeware, that will surpass that found in shareware. My hat is off to the programmers who make the marvelous free software available. I highly recommend new users to try Digipan first. This is a great PSK31 freeware, and I will be using screen captures from this software to show new users how to setup. After you have a handle on how to operate, then you might want to test drive a fancier software.. I use mostly Hamscope here, and PSK31 Deluxe. 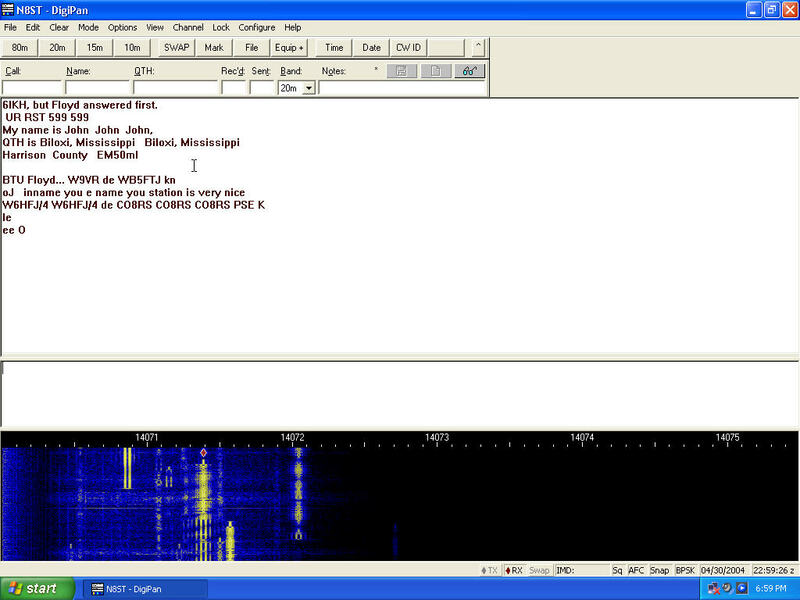 Hamscope will do a great job on RTTY if you download the MMTTY Engine from the MMHamsoft web page, and put the file in the Hamscope directory. They mesh well. The regular MMTTY software is good, but making and using macros leaves much to be desired. This is why I use the Engine only, in conjunction with Hamscope, which has lots of macro buttons available, and are very easy to setup and use. Some rigs are connected via only 1 data port, where some use as many as 3 connections to the radio. We will break the interface down into it's 3 sections. The above section is for receive audio. On some installations, it is as simple as shown. Please note, the left channel audio is the only audio channels that are used, and is normally the tip of a 3.5mm stereo plug. Always apply signal to the "Line In" jack if it is available, as using the "Mic" input of the sound card can cause distortion, due to preamplification at that jack. 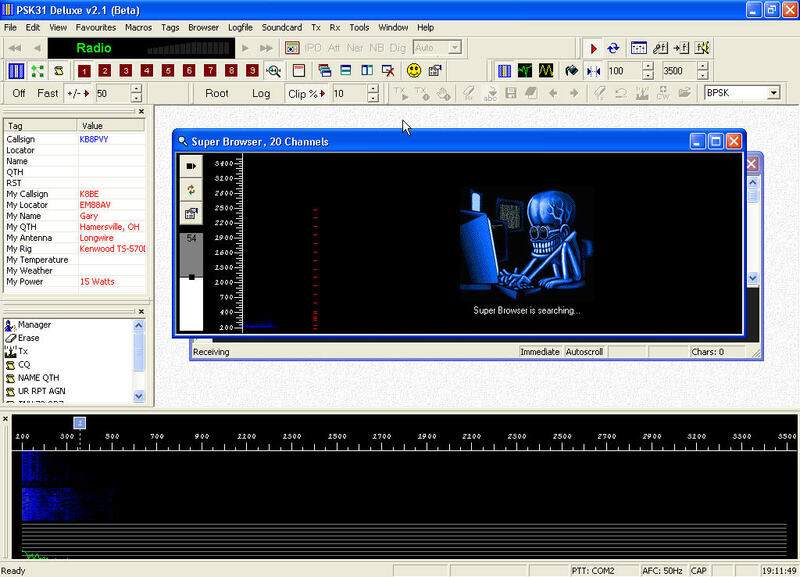 In figure 2, the transmit audio section is shown, including the adjustment trimmer, which is normally pre set to a standard level while being tested on the test bench. Also shown is the blocking capacitor. Also, use "Line Out" as opposed to the Speaker output if at all possible. Figure 3 shows how the PTT is accomplished. The 1.2k resistor is a line resistor to drop the serial port voltage to a level that will allow the optoisolator to trigger the PTT of the rig, and is a value that the manufacturer of the chip recommends. Note: The optoisolator in the PTT circuit has been changed to a reed relay in our current interfaces. More info is found later in this E-Book. Most software programs that will allow transmission, utilize the RTS or DTR pin of a serial port in conjunction with an optoisolator, or relay, to switch the PTT. 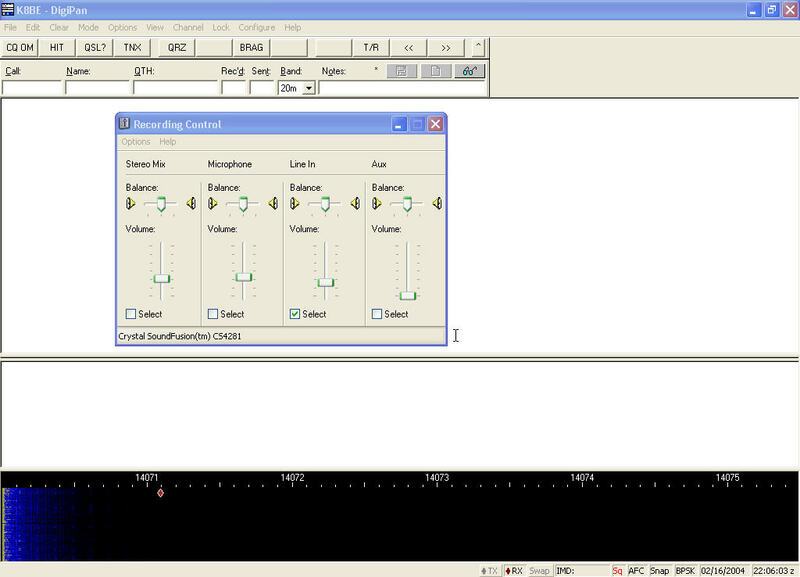 With some software, the Vox circuit of your radio can do the switching, instead of a relay, etc., but Vox will usually not work with rigs where you are connecting to a data port. Depending on the radio being interfaced, this can use only a few cables, or several. If your radio has a Data or Accessory port, that is the best spot by far to connect to, as one can normally leave the interface connected always, without interaction from mode to mode. The soundcard on the computer may have 3 or 4 ports. On cards with 4 ports, one is for a mic, one for line in, one for line out, and one for speakers. On cards with 3 ports, they are usually as follows: mic, line in, and speaker. If you have one with only 3 ports, not to worry, as a "Y" adapter can be obtained at Radio Shack, which will allow you to use some of the output that goes to the speaker. One can realistically use the mic jack of the sound card instead of the line in port, but that jack is normally a mono jack, and does tend to over drive the audio coming in to the computer. You will want to use the line in and line out jacks if they are both on your soundcard. 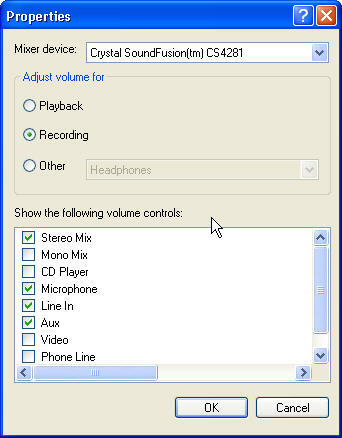 In looking at the computer sound card settings, you will find many different controls, for many functions. Normally you will be interested in line in, master volume, wave balance, and speaker. Start with the controls mid way open, and nothing muted. A bit of experimenting will show you which ones that you need or do not need. To bring up the soundcard controls, you can double click the small speaker icon in the lower righthand corner of your monitor. You should get a screen that looks similar to the one shown below. It shows the overall controls that are being used. If you click on "Options" on the above menu, and then the Playback button, you will get a screen similar as below. You can checkmark the controls that you want to use. After making your choices, click OK, and you will have the selected controls on your screen to adjust. After setting the playback controls, go back to Options, and then select the recording section, as shown below. Make your selections, click OK, and then adjust the appropriate controls. You should now be either ready to go with the sound card part, or very close. You may need to fine tune the adjustments. If you use the soundcard for other applications as many folks do, other things may use different volume settings, so you will want to find, and download a wonderful freeware named QuickMix. After your settings are where they should be for each and any application, simply save the settings in QuickMix with an appropriate name: ie: Digital, MP3 recorder, etc etc., and when you use the other software, you can load the settings which worked well for you. 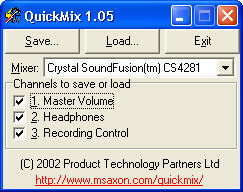 Below is a screen shot of the QuickMix loader. Now we are ready to load and setup a software. In this section, as previously mentioned, I highly recommend using Digipan if you are a new user. I say this because if you select a serial port that is not available for your PTT, after you tell it OK, and then go back to the port setting, it will revert back to "none". More than likely, you will be using com1 or com2, as these are the most commonly used. Load Digipan software, and then click on the Configure button, which will show up as below. Selecting "Waterfall Drive", will bring up your recording control as shown below, and on most applications, you will actually only need to have "line in" selected. You are now, at best, having some gibberish showing up in the receive area of the software. Now put your mouse arrow on one of the yellow lines coming down the screen, and click it once. You will then be copying the station that is transmitting. You will find that PSK31 (BPSK) is probably the most effective mode there is now. In theory, there can be over 90 stations in QSO at one time, in the bandwidth required for 1 SSB signal, and not QRMming each other. We have seen many times when there were over 20 stations on the falls at one time. Next, you will want to try to transmit. First turn OFF your speech compressor if you have one. If you have a menu on your rig which allows you to set a certain power level, set the power for 15 to 20 watts. This is all the power that you will need. Not only are the digital modes a "key down" situation, but higher power, or mic gain set high, will only tend to give you a wide dirty signal, and cause interference to other operators. If your rig does not have a power control, the output can still be controlled very easily. Use upper sideband for digi modes. The Digipan config menu has a Transmitter Drive button, which will bring up your playback controls, as shown below. Again, as on the recording control, you will usually only need 1 or 2 items selected, usually "Wave". Now, assuming that you are in the proper part of the band, and you can see other stations on the waterfall, find a clear spot away from the activity, and click that spot with your mouse. That is where you will be on the waterfall. If your rig has a power menu, and you have it set for 15 watts, click on the TX control on the Digipan menu, and quickly adjust the Transmitter drive control in Digipan, to where your output meter shows the proper amount of output, with a minimal amount of ALC. If your rig has no power adjustment, adjust the control as mentioned above, until your output shows 15-20 watts, which should reflect a low ALC level. You are now on the air. Don't forget to ID! Again, you might want to save your settings into QuickMix.... save it as Digipan. Most other software will be right in the ballpark with these settings, but if you play games and other items that use the sound card, they may use more volume than the digi modes. As you can see on the above image, Hamscope has many bells and whistles, including provision for rig control. One can do packet also, by putting the AGWPE in the same directory as Hamscope. It will hard key CW, and is also easy to setup and use. When using the Super Browser, you can not only see as many as 20 stations at one time, but actually see what all of them are typing at the same time. This is another fabulous freeware, and easy to set up. Audio: This has been pretty much hashed over earlier, but if you have trouble getting audio in or out of the software, make sure that you are using a 16 bit or better soundcard. Most computers built in the past few years are at least that strong, if not stronger. Make sure that your interface cables are connected to the proper jacks or ports. If you do not know which controls to use, and which are not needed, turn ON all of them, and set the level to mid range on all of them. Don't mute any of them. Do this on receive first! If you still do not get audio in receive, chances are that the soundcard is bad. This does happen from time to time. 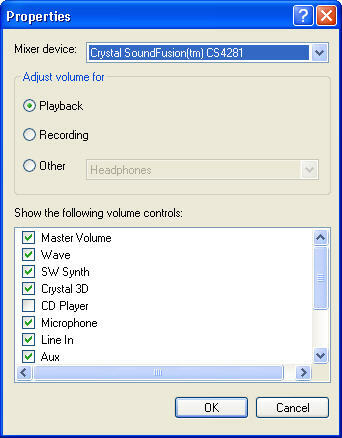 When you have RX audio, find which one(s) are needed by clicking the mute on one by one. No need to keep unneeded items to confuse things. If the RX audio is now working, but no TX audio, do the same as above.... trial and error method. PTT: If you are not achieving PTT, first check to be sure that you have chosen a valid serial port. If you are using a valid port, then here are possible solutions to the rig not keying. Are you using a laptop computer or a conventional machine? As mentioned in the beginning of this tutorial, some laptop computers have too low of serial port voltage to operate the keying circuit of the interface. If you have another computer available, try that one to see what happens. If it still does not function, then either the port that you are connected to on your radio is faulty, or the interface itself has a problem. We have found that some rigs, even new ones, have defective accy ports... not many thankfully, but it does happen. On not just our interfaces, but interfaces made by other manufacturers, there are not many weak points, except for the keying circuit. To zero in a bit, basically the optoisolator (or transistor in other manufacturers units) is the only weak link, but actually not that weak. With electronics, a part that has a flaw, will usually go out very fast. Even though we use first class parts, from very reputable suppliers, we have had optos go out. Usually they blow when I have them on my test bench, while testing and presetting the interface. If they work for longer than a few uses, they will run great for years. During the first 30 days of using our unit, if the chip blows, we will send another to you at no cost. They are socketed, and simple to replace. For folks that are adept at testing electronics, and have even an inexpensive volt/ohm meter, the following tests can be made: First, test across the correct pin for PTT on the data plug or mic plug, to the ground pin. WIth the software in TX mode, there will be a reading from 120 ohms (lower ok) to 180 ohms. That is normal, and the unit is working. The meter will initially be low, and rise to it's max reading when under test within a few seconds, which is similar to a soft start. If the interface is functioning, but your rig is not keying, your rig probably has a bad data port. If there is no reading, test where the serial lines connect to the circuit board. When in TX mode, there should be close to 12 vdc. If the voltage is less than 10.75 vdc, chances are that you have a too low serial voltage problem on the computer. If the voltage is in range, the opto has gone out. During the first 30 days, if the chip goes out, we will send you a new one free. After you have mastered setting up Digipan, and have made some contacts, you should have very little trouble using most any soundcard software. We hope that you will enjoy the digital modes as much as we do here. They are the best thing to come down the road in the more than 30 some odd years that I have been hamming. We do hope this tutorial has been helpful to you. This is a more in depth recap of the troubleshooting section. First, if you are not sure which com port is free, or if it even works, Use Digipan. If you set a com port that is already in use by a mouse or something else, when you click "OK", and go to the operating menu of the software, go back to the menu again, ans click serial port again. If it has reverted back to "None", the port that you chose is either not available, or does not function. The digital interface uses RTS to key the rig, however the default in Digipan is RTS & DTR, which is just fine. You can leave it set that way. Some rigs need to be told in their menu to make a connection operable, or to activate a data port. I have no idea which rigs need a menu setting to allow PTT from a data port. For this information, you will need to consult your manual. I always welcome any information about different rigs, so that I can help other folks that may not understand their equipment as much as others. Some computers, especially laptops, as mentioned earlier, do not have enough voltage available on their serial port to operate the optoisolator. There are even a few desktop computers that fall into this category. The PTT circuit of the interface requires close to the standard serial voltage of 12 vdc @ 60 mils. They are a little bit flexible, but not too much. The limiting resistor feeding the optoisolator is of a value that will allow proper keying, and also long life of the chip. There are few computers that fall into the low voltage category, but they are out there. The chip needs between 1 and 1.5 vdc at it's internal LED to key, and this is governed by the limiting resistor. There have been a few folks that changed the resistor to suit their equipment, but we only build the interfaces to standard voltages. The optoisolator is more demanding on voltage/current than a transistor, which will key on most any reasonable voltage, but a transistor does not afford your equipment the safety of full isolation. Most computers, especially desktop types, are more often in the correct voltage range. This has become a bit more of a concern as computers evolve. If you do not have a free DB9 port, you have two choices ... You can add a serial card. Or you can use a USB to Serial adapter. We sell one on our webpage, but you don't have to use this one. Any USB to serial adapter should work. Be sure to install the driver which comes on a CD with the adapters. If you don't install the driver, Windows XP will not assign the adapter a comm port number and it won't work. If everything looks good and still no keying, do not rule out the data port on the rig. Having had thousands of customers, we find from time to time that a port on the radio is bad. Fortunately not on many. We have heard from some IC-706 users that have had bad 13 pin DIN data ports, even a couple that were not wired internally. There have been a few IC-718 users (also with 13 pin) who also had port problems. The 706 rigs are notorious to not key when using the 6 pin mini DIN connection for some reason, so we refrain from making the mini DIN interfaces for the 706 rigs. No other port problems reported yet. Each interface has been tested before shipping to assure that all sections of it work properly, including pre-setting the tx audio to a level that seldom needs to be changed. Usually, when an electronic component is faulty, it will blow right away. Usually when a chip is marginal, it will blow on our test bench, but they can go out most any time. After looking through the above, and perhaps even checked the available serial voltage, you find that there is no keying, we are, in most circumstances, willing to send you a new chip, if you feel that you can change it. The chip is socketed, and easily changed. This holds good for users in North America, who have just received their interface. For those folks out of North America, we will only ship another chip if they cover postage. If you do not feel adept in changing a chip, you can send the interface back for a repair, however you will need to cover the postage both directions. How do I troubleshoot voltages? If you have a volt/ohm meter, this is an easy task. Open the interface box, and observe the position of the chip. Note the indentation or dot on the chip, which denotes pin 1. With the serial line connected, and keyed, carefully touch the positive lead of the volt meter at the input of the line resistor which is connected to pin 1, and the ground lead touched to pin 2, you will see the serial voltage. It should be approximately 12 vdc. If it is more than 3/4 volt less, your serial voltage is too low. If it is ok, and the software still keyed, take the ohm meter and connect to pins 4 (ground) and 5(PTT line). If the chip is working, it will be reading between approximately 100 and 180 ohms, there is more than likely a problem with where your unit is connected. If there is no reading on the ohm meter, the chip is blown. The chip does act similar to a "soft start", with the reading not being to full range instantly. The audio isolation transformers have so much overkill that they will last for years. They, as mentioned earlier, have been tested, and preset where applicable before shipping. If you are not getting audio through your interface, check to make very sure that you have the audio cables plugged into the correct jacks of the soundcard. This is a common problem. If they are correct, make sure that you have the proper settings turned on in your soundcard, with a reasonable volume level set. If you do not know which controls to turn on, turn all of them on, and set to half level. Usually you need the "Master Volume" control on, the "Line In" on, and the "Wave Balance" on, and all set half way open.. If you turn all of them on, simply click them off until you find the ones that you need. If you do not have success, either you do not have a needed control turned on, or the soundcard is faulty. With several thousand of our interfaces in use, we have not had a report of bad audio lines/ports on any rig. We have been asked why some stations are not good copy. This sometimes happens if the station one is trying to copy is either too weak for perfect copy, flutter (QSB) will also do this, as will audio levels set too high or too low. If you try to read what a CW station is sending, you can only get as good as copy as is being sent. CW being sent via a computer will, barring no QRM, usually be perfect copy. 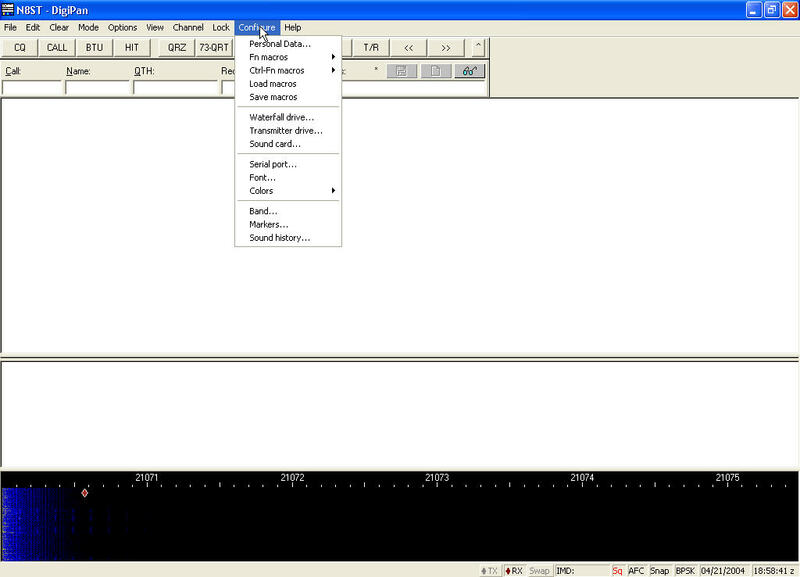 If you try to use the computer to copy CW being sent with a bug, you can usually forget it, as most bug users do not, for the most part, send true morse spacing. Again, the copy is as good as what is being sent. Any thoughts, information, or suggestions are always welcome. 73 es Have fun! The help and information file keeps on growing. Here are some recent changes/upgrades in our hardware, plus some tips from users are covered in this section. June, 2004: There have been some problems recently with "Homeland Security" killing chips in some of our interfaces while doing some sort of radiation scan on postal packages, designed to kill anthrax spores, etc,. That plus the increasing number of new PC's with serial voltages too low to key optoisolators, has prompted the need for additional methods of keying our interfaces. In keeping with the full isolation that our units afford, we have begun to switch to reed relays, which key at a lower and broader voltage range than the optoisolators did. The reed relays will average approximately 100 million operations, so they will outlive the optoisolator by far. Eventually, we will drop to 5 volt solid state relays, possibly keyed via USB ports, but at this time, we can find no economical way to proceed with this approach. We attempt to keep our prices very low, as this is our way to give something back to the Amateur Radio Community, but if we can find a way to obtain quality parts priced good enough to retain our current price, or very little increase, we will pursue that avenue. Serial Voltage too low to operate a rig control?? Recently, in a communication with Eric, N0HHS, about his Icom Rig Control being erratic, found that he was using a Compaq Armada Laptop, and the low serial port voltage was causing the problem. Eric was not afraid to dig into the problem, and came up with this solution. Normally, only the very high priced rig controls have provision for an external power source, but he connected a 9 volt battery to operate the unit as follows... Positive from the battery to pin 14 of the 4011 chip, and negative to pin 13, which is a ground line. The positive line was connected at pin 14, after the diodes. The change cured the erratic operation, and with the current draw of the 4011 chip being low, the battery will give long service. A small wall wart would also work. If you do this mod, make sure that you turn OFF the RTS and DTR lines in the software. Note: This is another possible implementation to be addressed in the future. Thank You Eric. This is not something that we have encountered before, but it could happen to most any type of rig. Peter, W6DEI, had a problem getting his FT-900 to key. He tested the PTT circuit of the interface, which read a normal to low resistance reading, but would not key. Peter put a trimmer across his PTT line, with a ohmmeter reading the resistance where keying would occur. His rig's PTT circuit was found to be very critical, and keyed just a few ohms below the level where the optoisolator would trigger. To cure this problem, he paralled a resistor across the PTT line, which allows his rig to key fine. Note: The reed relays we are now using have a very low contact resistance, so this should not happen anymore with rigs critical to resistance. Thank You Peter for your information. This item was brought to my attention by Bob, W0RY, who by the way produces GREAT software. When using Packet in Hamscope via the AGW Packet Engine, you will not be able to use a rig control, as the AGWPE takes control of the serial port when in Packet mode. Our rig control uses the RTS and DTR lines to power the rig control interface, so with the Packet Engine drawing from the serial lines, there is no power for the interface, which is a weak point, but only if using our rig control while using the AGW Packet Engine. Bob cured this situation by feeding power to the rig control from the 13.8v pin on his rig. Note: This topic was touched upon lightly above, regarding low serial port voltage. Thank You Bob for sending this information along to me. In addition to switching to reed relays in our digital interfaces, we now use them in our CW Hard Key Interfaces as well. The keying is much cleaner and crisp, and very stable, even at high keying speeds. The only down side, if you could call it that, is that formerly, the chip and related components were inside a DB9 hood, but with the reed being larger, it is now in a small mini-box.. We have not increased the price of the Hard Key interface, so this is a plus. This item really performs! These frequencies are to be used as a guide to find the related signals. They have come from several sources, and are, in no way, guaranteed to be complete, accurate, or inclusive.